Clean the leaves and silk strands from the corn. Using a sharp knife, separate the corn kennels. Pressure cook with a cup of water and sugar. Reserve 2 –3 tblsp of corn for garnish. Blend the rest well. I used my hand blender, if you are using a mixie, drain, reserve the water, and cool down and grind to a smooth paste. Strain it to remove the skin. This step is optional, but I do this always. Add milk,the reserved corn kernels and bring to boil. Add the coriander leaves and if using green chillies, add it. Boil for 4 minutes and lastly add the corn flour dissolved in 2 tblsp of water. Boil until thick. Add salt and pepper generously and mix well. Garnish with the chopped spring onion if desired. Green chilli adds a different flavour and taste which I like but Vj doesnt. So If you want you can add or omit. I personally don’t like any sauces like soy or chilli in this soup. So I dint add. I read in wiki that cooked sweet corn has tendency to fight cancer. 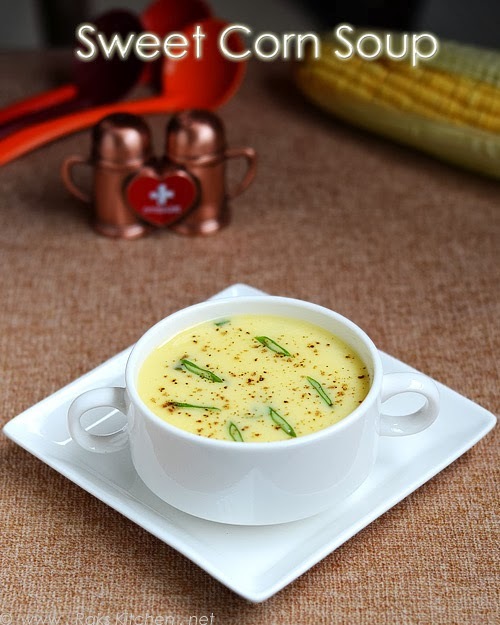 Simple yet healthy sweet corn soup is ready to enjoy. Serve hot with bread toast for a filling meal. Nice soup raji. Can we make this soup without grinding the corns? Wish to have a bowl of these soup. Amazing pictures Raks!! I love sweet corn soup! i use to prepare whenever i get a corn 🙂 loved the photos ! Happy New Year…love the way you made the soup…though I have never tried blending the corn..
healthy one dear I also consider corn and tomato only as my fav soup,me too not a big fan of others. Want to try looks so different and classic.I want to know if adding chilly wont the soup curdle. Lately I have just been making tomato soup. Think it's time to change it up. Thanks for sharing the recipe! A prefect soup for PAris chilled weather, love to finish that bowl. Never made sweet corn soup at home. Looks too good !! I added the day I prepared, it dint curdle. Wow Raji Soup looks delicious.Wonderful presentation as ever. Delicious and healthy soup. Very appropriate for this chilled weather. Looks so creamy, love the first click! Yummy soup, my fav too!! Lovely soup recipe Raks. Looks very creamy and yummy!!!. Soup is a wholesome meal for me. Any recipe gets bookmarked and this one I am doing with an extra mark on it. The picture looks very inviting. Hi there. Food on Friday: Corn on Carole's Chatter is now open for entries. This looks like a good one! I do hope you link it in. This is the link . Please do pop back to check out some of the other links. Have a great week. This soup looks very creamy. I always thought sweet corn soup suppose to be a chinese one…but this amazing. Can I make this without adding milk? It gives the important rich consistency to the soup, so not sure how it would be if you skip it. Mam is it compulsory to use milk because i don't like milk…? Hi..is it necessary to add corn flour, or can I skip that?